While it is our understanding that the HMRC bill that resulted in the latest winding up petition has now been paid, we still await official confirmation from the club. We are now calling on the Directors of Oxford Utd to give some frank and honest answers to the questions we have repeatedly asked, and to do so directly to the fans, in a manner that addresses our fears for the club we all love. The time for vague assurances in programme notes and calling on the fans for increased support is over. Fans rightly demand honest facts about the financial health of our club. We have on paper a fabulous board of high net worth directors with experience in football ownership, so why are they allowing the club to stumble from one winding up petition to another and damaging the club’s reputation, and their own, in the process? The questions we ask are simple but fundamental to our understanding of the situation we now find ourselves in. 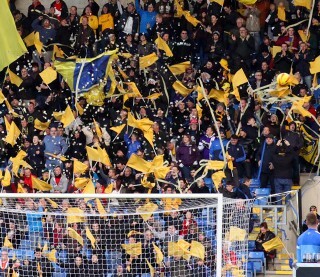 Oxford fans, like fans everywhere, can be vociferous, demanding and hard to please. We are also knowledgable, loyal and will drag ourselves from one end of the country to the other to support our team. Having seen our club in recent years plunge to the depths of the National League, we know the cost of failure. We also know that the recovery to League 1 was hard won over a decade and we don’t want to see that lost and a return to square one. We are not blind to some of the really impressive things that are going on at our club. The academy programme is as good as many can remember and their success is a matter of immense pride to the fans. Seeing youth players like Shandon step up and make their mark is incredible. The training ground is, I suspect, the best facility we have had in our 125 year history. With these positives to hold on to and grow from, we ask our owner and shareholders not to turn their backs on those fans who now fear the worst. Give us something to believe in again.